Figure 1. Positive and negative marking of nickel super alloy using femtosecond laser pulses. 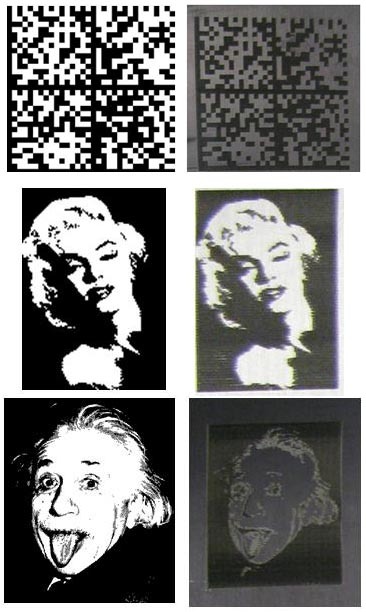 Shown are the source bitmaps (left column) and the processing result (right column). Ultrashort laser pulses are known for their precision in micro-machining and for their capability to process soft, brittle, extremely hard and even explosive materials. Due to the short interaction time, the major part of the pulse energy is used to ablate material, while only a small part causes collateral effects as heat- or shock-affected zones. The shorter a pulse, the less energy is needed to ablate a specific volume of material. Also, this allows marking of strong metallic compounds without compromising their mechanical properties. You can include machining, marking, roughening, and surface treatments (such as cleaning and hardening, etc. ), to be expanded as we lay claim to the multitude of ground-breaking industrially-valuable applications.